Ninnu Kori Censor Report | Nani Latest News Ninnu Kori Censor Report: Nani's latest movie Ninnu Kori completed all the censor formalities and it has been awarded clean U certificate with appreciations. 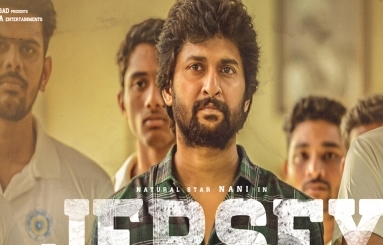 Natural Star Nani is on record breaking spree and he scored six massive hits in a row. His last outing Nenu Local is the actor’s biggest hit and he is all set with his next movie titled Ninnu Kori. Directed by Siva Nirvana, a debutant the movie is said to be a breezy romantic entertainer and Nivetha Thomas worked with Nani again after a blockbuster like Gentleman. The entire shoot of the movie has been wrapped up and the recently released theatrical trailer is a massive hit all over. The movie completed all the censor formalities recently and it has been awarded clean U certificate. Ninnu Kori has been passed with no cuts and with loads of appreciations. Aadi Pinisetty played a crucial role in the film and Gopi Sundar composed the music. The audio album is a massive hit all over and is trending across the music circles. Top producer DVV Danayya along with Kona Venkat produced Ninnu Kori which has been announced for July 7th release.